To develop the design from initial concept through to installed facade, Pilkington Architectural provide a full range of sales details, standard assembly drawings, component manufacture drawings and installation manuals. 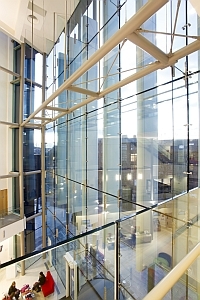 Experienced engineers are also on hand to discuss options for customising the standard hardware and developing bespoke structual glazing solutions. This same design team are able to advice on the provision of solar control, accoustic damping and enhanced security performance when the need arises.